This month’s CNN Culinary Journey will bring viewers on a trip across Europe with “gastronaut” René Redzepi, visionary behind the two Michelin-starred Nordic restaurant, NOMA. Redzepi has rose to fame at the forefront of the New Nordic movement, in which his obsession with local, seasonal and raw ingredients are constantly at odds with the harsh climate of the North. His drive to connect the natural world through foraging into forests and beaches of Copenhagen with gastronomy, and his ability to refine all this into the menu of NOMA has catapulted his restaurant into world fame. 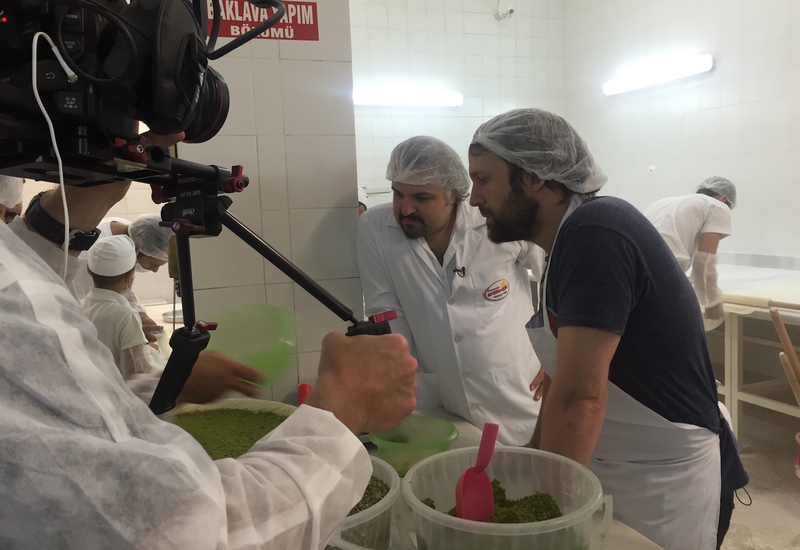 “Culinary Journey” will see the forager-slash-chef on a trip to Istanbul, home of the iconic dish: the Baklava. Back in Copenhagen, Redzepi will put his own spin on the Middle Eastern treat. “Culinary Journeys” is a series of monthly half-hour shows on CNN International, which feature world-renowned chefs on a journey to explore the cuisine of one of the world’s food hotspots. In each episode, the cookery travelogue sees a chef leave the bustle of their own kitchen to discover a culinary experience in another country. 1) What should the audience look out for on your show at CNN Culinary Journeys? The unique and diverse foods of Turkey - this was a big surprise to me. 2) Tell us something about your gastronomic journey and why you call yourself a 'gastronaut'? The term gastronaut is said with self-irony, but it eludes to the fact that we are explorers of food cultures, and I love travelling and exploring a place through the lens of its food. 3) What would you like the world to know about the world of international gastronomy? Why should they explore this cuisine? What is so special? The sheer range of recipes, cooking methods, the historical aspect. Those three should be a selling point for anybody. Plus it’s so damn delicious! 4) What is your mission in the coming few years? What do you want to achieve? We will keep developing the kitchen here, working towards a more green diet. 5) The last meal you remember was where and what do you remember it for? That was a couple of days ago, me and some members of our staff were at my home on a Sunday and we had a pasta cook-off. There was a chef, Dan Giusti, who did cabbage cooked in olive oil with anchovies for hours, served with hand cut tagliarini and white truffles. 6) What is the best compliment you received for your food - one that you will never forget? Knowing that guests appreciate the efforts we go through, many hours a day- is what makes it all worth it. I think that food has always been visually spectacular, if anything it is becoming less so than the traditional European food from the royal courts and so on. I think there’s much better food than before though. 8) The gastronomic world is constantly evolving. To you, does a chef always need to reinvent himself to last in the long run? I don’t believe so. In the case of Noma, we love to move forward and challenge the status quo, but I respect equally chefs that are trying to serve a great familiar meal each night- it’s the same commitment. 9) You represent Nordic cuisine well. How would you define it? I wouldn’t know how to define it, it’s still so very young. What we’re seeing are still the baby steps, and we’re still finding our way, trying to make sense of it all. Ask me again in 10 years. 10) What do you remember most from your experience in Istanbul? Istanbul to me was like stepping back in time. I grew up partially in Macedonia in a Muslim household, in a very rural part of the world. Istanbul - there were so many memories, so many smells, so many flashbacks to my childhood. 11) People have a particular vision of Turkish cuisine which is often limited to fast-food. Can it be promoted in a better way and how? I do agree that there is a misconception of Turkish food being limited to quick, cheap shawarma or kebab. In order to really experience it you really need to be in the place. More on CNN's Culinary Journeys here.